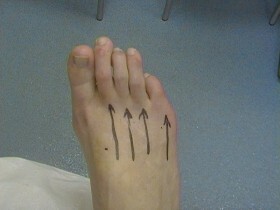 Surgical recovery is generally 2 weeks after which patients can begin to return to normal activities and footwear, should a digit be fused, wire fixation is usually left in place for up to 4 weeks. 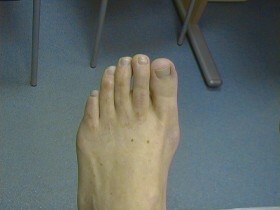 Some patients consult with long toes that require shortening. This enables them to feel more comfortable when they wear open-toed, fashionable footwear. Surgery is able to straighten toes, thereby removing the pressure sites responsible for painful skin lesions such as corns and callouses. 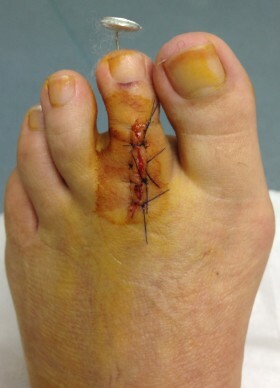 Toe shortening and hammer toe surgery at The Yorkshire Foot Hospital based at The Lawrence Clinic in Leeds. This surgical procedure is carried out under local anaesthesia on an outpatient basis performed by Consultant Podiatric Surgeons, Mr.Anthony Wilkinson and Mr.Stephen Finney. AFTER This patient had undergone previous hammer toe and toe shortening surgery to her other foot six months prior with an excellent surgical response.